A new call for the international award on meteorology Eduard Fontserè will be opened in the coming weeks. Presented by the Catalan Meteorological Society (ACAM) the goal of this award is to promote and disseminate knowledge of the meteorology and climatology of the Mediterranean basin. The award is sponsored by the Catalan Meteorological Service (MeteoCat) and the Environmental Area of Diputació de Barcelona, and the prize is €2,500. It will recognise papers published in atmospheric science journals included in the SCI (Science Citation Index,Thomson Reuters) or SCOPUS databases between 2017 and 2019. The work shown in the paper should propose new and relevant investigations about meteorology or climatology in the Mediterranean basin and offer a noteworthy contribution to this field. More than 20 papers from around the Mediterranean basin, from the east to the west basin, were submitted in 2017. The award committee highlighted the high quality of all of the papers submitted in that call. The committee decided unanimously to give the award to “SPREAD: a high-resolution daily gridded precipitation dataset for Spain – an extreme events frequency and intensity overview”. The authors of the paper were Roberto Serrano-Notivoli, Santiago Beguería, Miguel Ángel Saz, Luis Alberto Longares, and Martín de Luis, and it was published in the Earth System Science Data journal (https://doi.org/10.5194/essd-9-721-2017). The committee were of the opinion that the paper presented relevant contributions to the knowledge of Mediterranean meteorology and climatology. The authors presented the first daily database of precipitation over Spain from 1950 which has a very high spatial and temporal resolution. The methodology used could be considered as a reference methodology that can be applied to similar data for other areas along the Mediterranean basin. This method and the database will facilitate the improvement of the knowledge of daily precipitation over the Mediterranean basin. 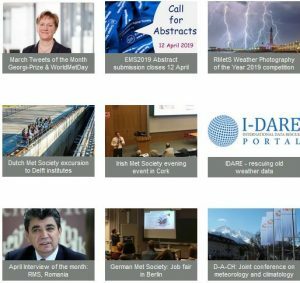 We would like to encourage researchers to submit papers to this call and contribute to a better understanding of Mediterranean meteorology and climatology. We are looking forward to receiving contributions. For more information see www.acam.cat/PEF.